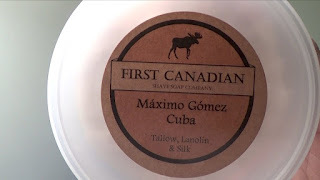 Company: First Canadian Soap Co.
Website - First Canadian Soap Co.
Today I have the pleasure of introducing a new shaving soap from Brian Hoffman of First Canadian Soap Co. This Cuban inspired soap is called Maximo Gomez, Cuba named after Maximo Gomez, a Major General in Cuba's Ten Year War (1868–1878) against Spain. He was also Cuba's military commander in that country's War of Independence (1895–1898). Not much has changed with the packaging I still like the clear plastic tub that Brian uses. You can really see the soap and for Maximo Gomez you can see how its mixed together. I’ve seen this kind of swirling mixture before with other artisans shaving soap but you never get to see it from the bottom or the sides with the tubs they use. I’m not sure if this mix is due to the new formula or not only time will tell. This Cuban inspired fragrance is fantastic with notes of zesty citrus, tobacco leaves, vetiver and patchouli fuse together to convey a fresh, very masculine fragrance. I have found glycerin and hydrogenated palm kernel oil to be the only two additional ingredients among the usual others in his soaps new formula but I’m just going by the label so I might be wrong. After using this soap for a week I really wanted to reach for it’s aftershave counterpart but sadly I’m not sure if one is going to be made so I used the clean vetiver from Fine which turned out to be a great alternative. For the shave I used my Maison Lambert brush and the German 37 slant from Razorock. Brian told me that his soap is thirsty but I always ring out a brush full of water into the lathering bowl so I hardly noticed if it was. It took little over a min to witness was a shiny yogurt like lather, rich and creamy which provided great coverage and penetrated right into my 4-day old beard. My razor was able to go over my rough spots with ease offering great slickness and glide for the entire shave. The post shave feel was excellent leaving my face hydrated and smooth as silk. So another great shaving soap to add to the den for sure. This new formula did improve on the post shave feel. Brian should stay with this new direction he’s taking. Wet shavers will all benefit from it.